The Baranow Treestand is comprised of two moderately sized forest patches approximately 750 m apart that are connected by open park space and treed areas. The forest patches consist mainly of deciduous trees and there is a constructed wetland and stormwater facility located immediately south of the southern forest patch. A newly constructed multi-use trail connects the two forest patches and also has connections to the neighbourhood trail network. The treestands provide habitat for a variety of songbirds and small mammals while the newly constructed wetland and stormwater facility to the south provides aquatic and upland habitat. The interface between these two habitat types provides additional opportunities for certain species to fulfil their life cycle requirements. The quality of habitat provided by the constructed wetland will improve over time as native plant establishment progresses. Multi-use trail system along the eastern periphery of the natural area. 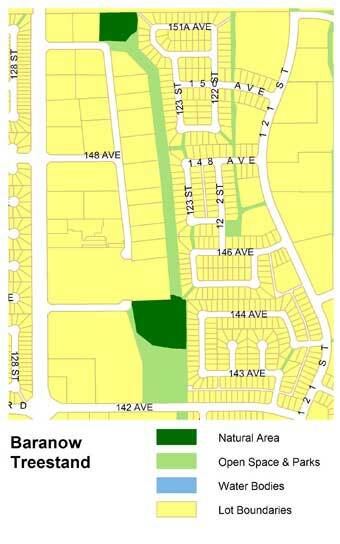 Access to the Baranow Treestand is available from 145 Ave. off of 127 St. 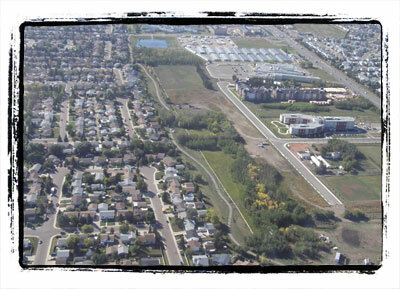 Alternative access is provided at several locations including the power line corridor at 127 St. north of 151 Ave., 142 Ave. directly west of 123 St., and greenways located at 145A Ave & 123 St. and 151A Ave. & 124 St. A multi-use trail connects the northern and southern portions of the Baranow Treestand. Access to the interior of the stand is not provided by the trail system; however, the natural area can be viewed from the trail system that skirts the edges of both the northern and southern portions. Although the Baranow Treestand is relatively small, a variety of wildlife (particularly songbirds) can be viewed or heard at this site. Due to the proximity of aquatic habitat provided by the constructed wetland and stormwater facility to the south of the natural area, other species such as boreal chorus frogs and waterfowl may also be observed at this site.